Carsharing is probably one of the hottest new trends in Berlin this year. Many carsharing companies like DriveNow, SIXT Share, Car2go or Miles offer their brand new cars for short term rent around town. It can be difficult to find the best car sharing company for your needs, so let’s compare them and see which one suits you best. 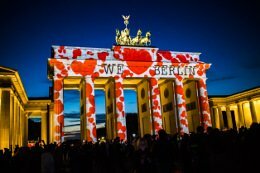 We only took DriveNow, SIXT Share, Car2go and Miles into consideration as they offer the most cars around Berlin and they are so-calles free flow offers. That means you can pick them up and leave them wherever you want to. E.g. Deutsche Bahn offers carsharing as well, but you have to pick up and park the cars in designated parking spots, which makes their offer not flexible enough to be considered here. DriveNow is a carsharing company operated by BMW and recently merged with Car2go. But for the time being both companies are still operating with their own fleet of cars. DriveNow is available in many major German cities including Berlin, München, Düsseldorf, Cologne and Hamburg. Right now DriveNow had over 3.300 cars all around Germany to rent. In Berlin, it feels like every second car on the street is one of DriveNow’s BMW 1, Mini (Coupe and Cabrio! ), X1 or even ActiveE. Many people nowadays – especially younger people – don’t see the need to own a car in Berlin, as signing up with DriveNow or any other carsharing company is much cheaper. There are 2 ways to book a car: Either with the DriveNow App up to 15min in advance or by walking past a car and opening the door with your app. The DriveNow App is available for IOS as well as Android, and lets you see all available DriveNow cars around your area on a map. Just choose the one closest to you and make a reservation, which is valid for 15 mins before someone else can book that car again. Signing up with DriveNow costs only 19€ (instead of around 29€) with 30mins already included. Prices per minute depend on the type of car you choose and start at 33 cents/min. DriveNow covers the most important parts of Berlin, including Berlin Tegel & Schönefeld airport. 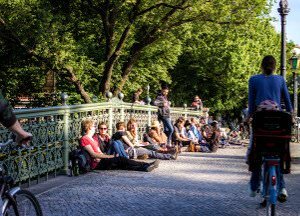 You can park your car anywhere within the S-Bahn ring, and in some parts, like Prenzlauer Berg, even outside that ring. Of course you can use the cars outside that area, but if you park it outside the operating area you’ll have to pay a fine. One of the newest carsharing offers available and a pretty good alternativ we must say. 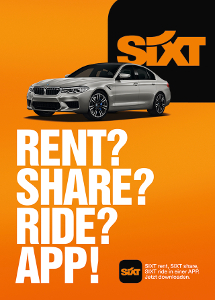 SIXT Share has one big advantage, which is SIXT has been in the business of rental cars for decades already. SIXT is probably the biggest rental car company alongside with Europcar and Enterprise and therefore already a well know and trusted company. So the decision to enter the carsharing market might not come as such a big surprise. But what is a big surprise is how SIXT combines carsharing and rental cars in one app. So no matter if you want to rent out a car for a quick grocery shopping trip or you spontaneously want to drive to the coast for 3 days all you need to do is download the app and start driving. Cars can be picked up within the limits of their business area or at one of the 500 SIXT stations in Germany. As a little welcome bonus right now the first trip with SIXT Share is for free (up to 10€ trips). Every other trip will cost you right now 30cents per minute or if you want the car for the whole day it will be 59€. Car2go is a carsharing company operated by Mercedes Benz, together with Europcar. 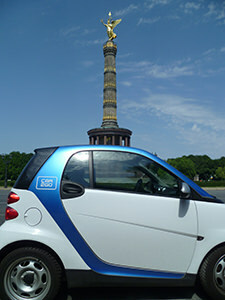 In Germany, Car2go already operates in 7 cities and offers more than 3.000 cars to rent, which offers a slightly higher density of cars around Berlin. Whereas with DriveNow you have the choice between many different cars, that are also suitable for 4 people, Car2go exclusively has Smart cars in their fleet. So if you plan on driving to IKEA to get some new furniture, Car2go might not be your best choice. But if you only need the car to get from one place to another quite fast, you will come to love those Smarts. The old excuse that you didn’t find a parking spot won’t be valid anymore, as these Smarts fit in anywhere. If you compare the prices of Car2go and DriveNow you will see that Car2go is slightly cheaper than DriveNow. Car2go charges only 29 cents per minute for their cars. If you plan to stop for a while you can do so and only pay 19 cents per minute, or if you need the car for one hour there is a fixed price of 14,90€. Car2go also offers an App for IOS and Android that lets you book a car online in advance. Cars can be booked and parked anywhere within the S-Bahn ring and in some places, like Steglitz or Dahlem, even further outside. What what used to sound like something out of a 80’s gangster movie is the newest player in the field of carsharing companies in Berlin. Just recently rebranded from Drive by to Miles this is a great alternative for carsharing in Berlin. Miles’ area of operation is a bit smaller than that of the main competitors DriveNow and Car2go. However their cars are all very new, still in good shape and fun to drive. Also the pricing is a bit different from what you get at the other carsharing companies. Instead of paying for each minute of your rental you only pay for the distance you drive. This is a lot less stressful and can come cheaper during heavy traffic. For us Miles is a great alternative to the more well-known carsharing companies DriveNow and Car2go. In order to have an overview of the 3 carsharing companies we took for the prices only the cheapest option into consideration. Business territory S-Bahn Ring and beyond in Lichtenberg and Charlottenburg to Steglitz S-Bahn Ring and beyond. As you might have noticed already, Car2go and DriveNow offer very similar services. Both companies let you book your car via their very good Apps and both companies have around the same prices. And best of all in 2018 both companies decided on merging together – let’s wait and see what this means for the carsharing market in Berlin. As Car2go only has Smarts to rent, you can’t use them if you need to transport any big luggage or if you are more than 2 people. DriveNow, on the other hand, lets you choose between different car models that can also be used for a small shopping trip to IKEA. And last but not least, Car2go and DriveNow operate in the same areas in Berlin; Car2go having the advantage of covering a slightly bigger area. But, as you rarely need a car outside the Ring, that should not be a problem. If you are unsure about which company to sign up with, you might consider signing up for both Car2go and DriveNow. As a second alternative we highly recommend giving SIXT Share a go. First of all it might always happen that there is no Drivenow or Car2go car nearby. And secondly SIXT Share just offers more than the competitors, which is the possibility to spontaneously rent a car for the whole day or 5 days just like that. Especially during rush hours, most cars might be in use, so having 2 options to choose from might come in handy. You will still save a lot of money, rather than constantly taking taxis, or even having your own car. If you don’t feel like driving yourself you might want to check out how public transport in Berlin is working. And if you are into biking why not try out one of the many new bikesharing companies in Berlin?